“If the network thinks we are going to be disheartened [by the layoffs], they are wrong. This only strenghtened our resolve to fight for what is just,” said Talent Association of GMA 7 (TAG) president Christian Cabaluna. The media giant sacked 11 members of TAG in a new round of layoffs, despite a favorable ruling by the National Labor Relations Commission last June 25. The terminated members of TAG came from GMA’s award-winning shows Imbestigador and Reporter’s Notebook, including Mike Manalaysay who had been with the network for 12 years and 6 months. Cabaluna (Imbestigador) had stayed with GMA for 9 years. While two other senior staff members, Mariet Cabral (Imbestigador) and Michael del Rosario (Reporter’s Notebook) had been working for the network for 10 years. Talents work on a per show basis and are not entitled to benefits regular employees enjoy. They will not receive separation pay and other benefits despite their long years of service. TAG was formed with the objective of ‘making all TV network talents regular employees,’ according to their website. 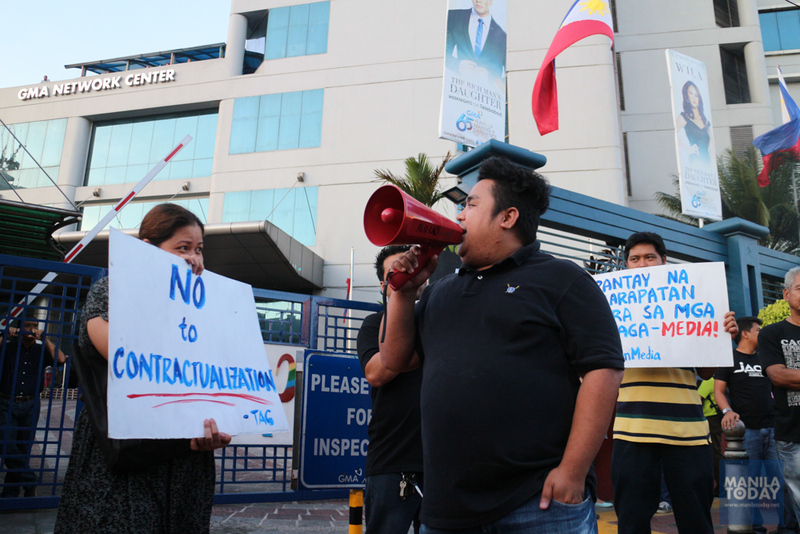 Last June 25, the NLRC ordered GMA to grant regular employee status to 107 talents who filed an unfair labor practice case against the network in May 2014. GMA filed an appeal against the NLRC decision on June 6. “This is proof of the network’s arrogance. This is blatant disrespect of the law. it only shows what kind of employer GMA is, considering that FLG (GMA chief Felipe Lapuz Gozon) is a lawyer,” quipped Cabaluna. “We expected this to happen,” said Cabaluna. “We felt that the network would not take the NLRC decision lightly,” he added. “Working for the network’s show Imbestigador taught us core values. To fight for what is right. To expose wrongdoings in society, to help the oppressed. What more if we ourselves are victims?” said Cabaluna. According to Cabaluna, GMA’s move was done to stall TAG’s momentum. “Before our initial victory, other talents were having second thoughts in joining us, but we have proven that justice is on our side,” he added. TAG mulls filing illegal dismissal cases against GMA.